My forte is not DIY or building furniture. My forte is eating cake, stroking cats and dogs, and crying about not living in Canada, it is not building furniture; and yet I somehow built two hairpin nightstands. Honestly, my DIY skills are woeful. I am better suited to providing refreshments, unless you want me to have to reassemble a TV stand three times because I keep putting bits the wrong way round (that happened once). I fell down a Pinterest hole one day while looking for bedroom inspiration and saw a mid-century hairpin nightstand that I fell in love with. When I did some research I found some beautiful ones on Etsy, but I can't justify well over £100 for someone to stick our phones, books, and TV remote. 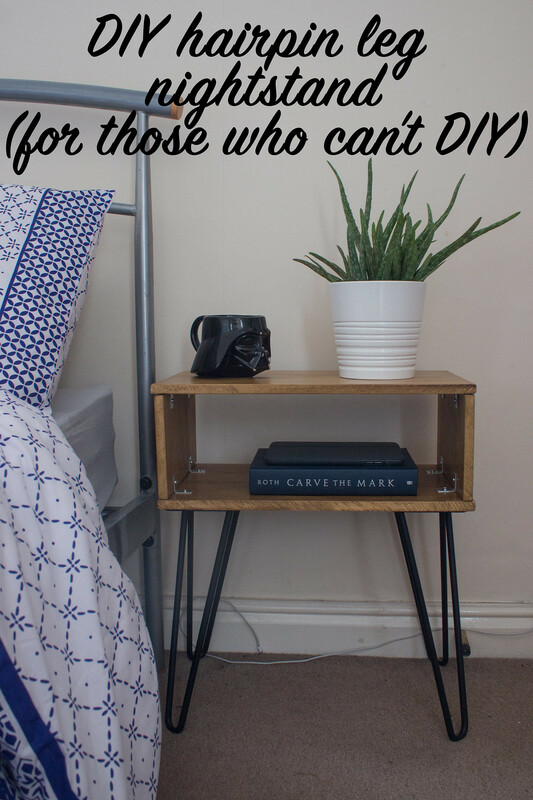 I skulked back to Pinterest and ended up finding a tutorial for a hairpin nightstand which looked doable even with my poor DIY skills. Luckily, my Mum was having a clearout and was getting rid of a big piece of wood that she'd used as a desk top. It was in perfect condition and was exactly the right size to make two matching nightstands; winner! I'm so pleased with how they turned out. I had this vision in my head of what they would look like and I didn't really think they would live up to it, but they surpassed it. If I can make hairpin nightstands, anyone can, trust me. It required a handful of skills and the guidance of my Mum, who I swear can do pretty much anything (I would not be surprised if she told me she was secretly an astronaut). Screws: this will depend on the thickness of your wood and whether or not your legs come with screws. My legs did, but they were a a couple of mm too long for my wood, so I had to buy more screws. I used 32 screws for attaching the legs and 32 screws for attaching the brackets. If you don't already have a saw, sandpaper, and a screwdriver, you will need those too. All in all, I spent about £120 on the materials and tools for two nightstands. 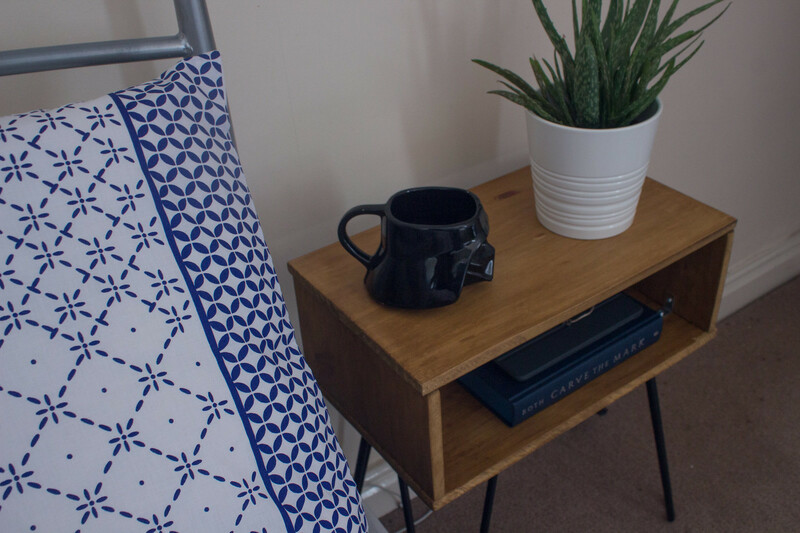 No, that isn't super cheap but it is cheaper than paying over £150 per nightstand. Plus, I have tools for any future DIY endeavors...and the wax will be used again to polish the nightstands. And honestly, the feeling of walking into a room and seeing something you made sitting there is priceless. The biggest cost by far were the legs, which you might be able to save some money if you shop around but I didn't see anything much cheaper. Mark out your pieces and saw them out. Sand the edges until they're smooth. 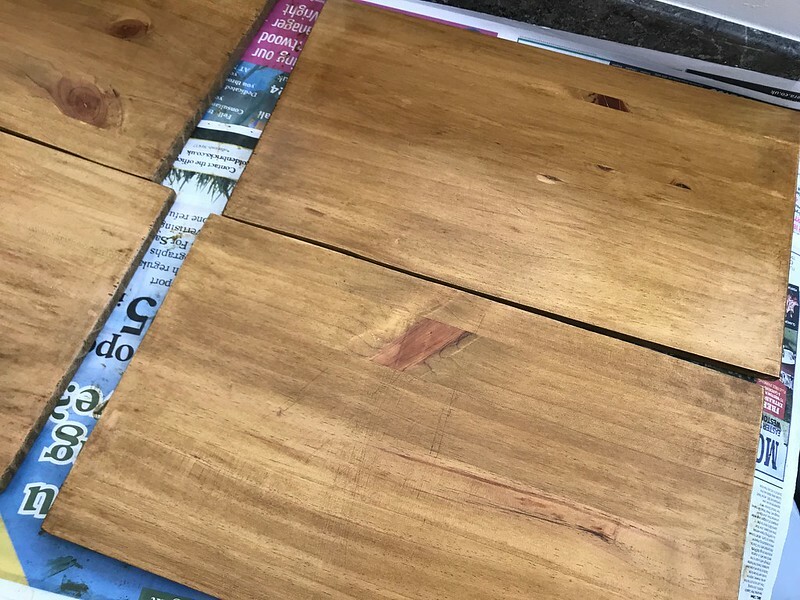 If you're re-using wood like I was, you might need to sand off any marks or old wax. If you need to remove any old wax use some turpentine in a well-ventilated area; it might smell nice, but y'all don't need to get high off it. Decide which pieces will be top pieces, bottom pieces, and which way you want the side pieces; this probably isn't a big issue if you're using new wood, but it's important if you're re-using wood that might have scratches, holes, or marks on it. Apply whatever wax, varnish or paint you want; or leave it plain. Mark out where you want to place your corner braces; we marked ours 6cm from the front and back edges to make sure the corner brace screws didn't get in the way of the leg screws. Attach the corner braces; if you have a small screwdriver this will be really easy because you'll have no problems attaching the top. If you don't, it is a little trickier, but it is doable. Mark out where you want the legs to go and screw them in. 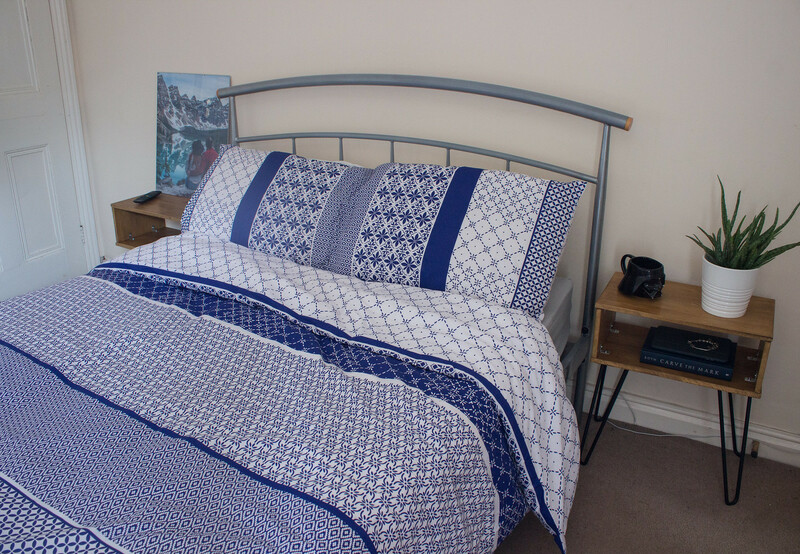 Put your table in your bedroom and drool over how beautiful and Pinterest-worthy it looks. Put the kettle on, have a cup of something hot and eat cake, you've earned it. All in all, it took my Mum and I about six hours to finish two nightstands. The longest part was prepping and waxing the wood; screwing it all together and attaching the legs probably took about an hour. 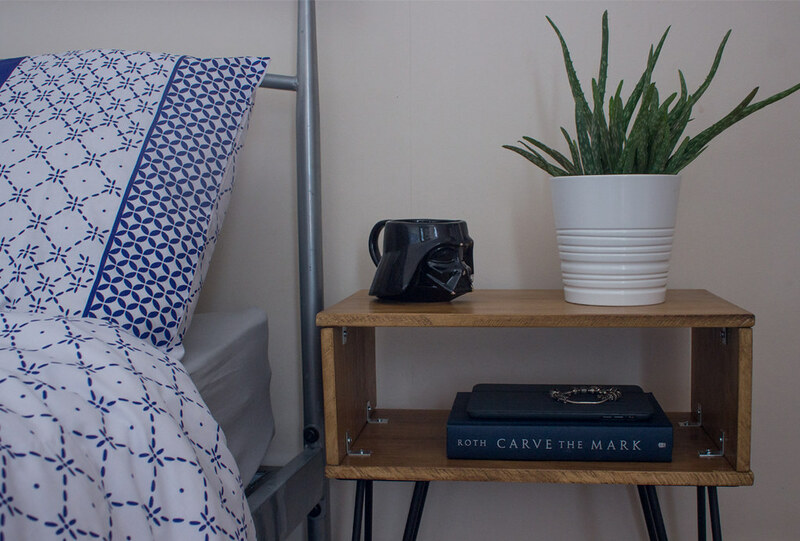 If it's nice outside, you could easily finish this project off in a day and go to bed with a beautiful hairpin nightstand next to your bed the same night. 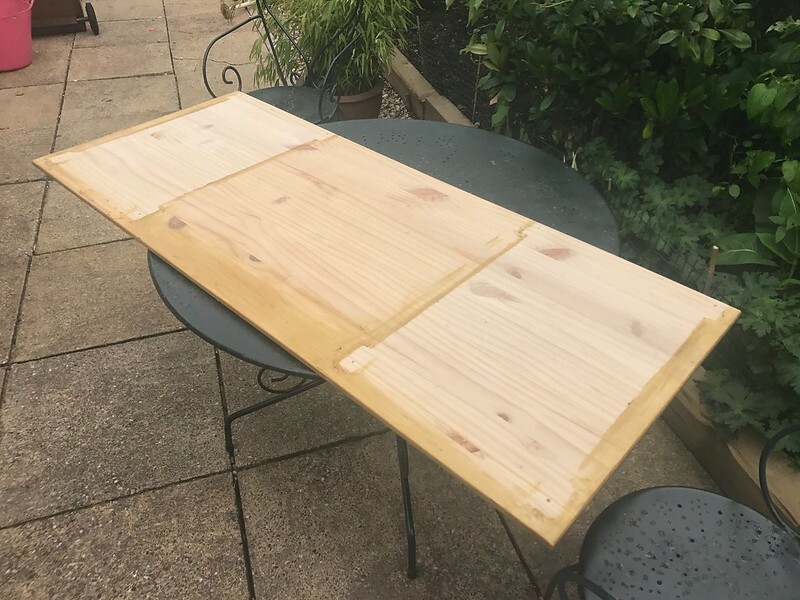 It was seriously easy and it's so satisfying to 1) get to use up something which was going to landfill otherwise and 2) to see something you've made getting put to use in your own home. Have you ever made any furniture? 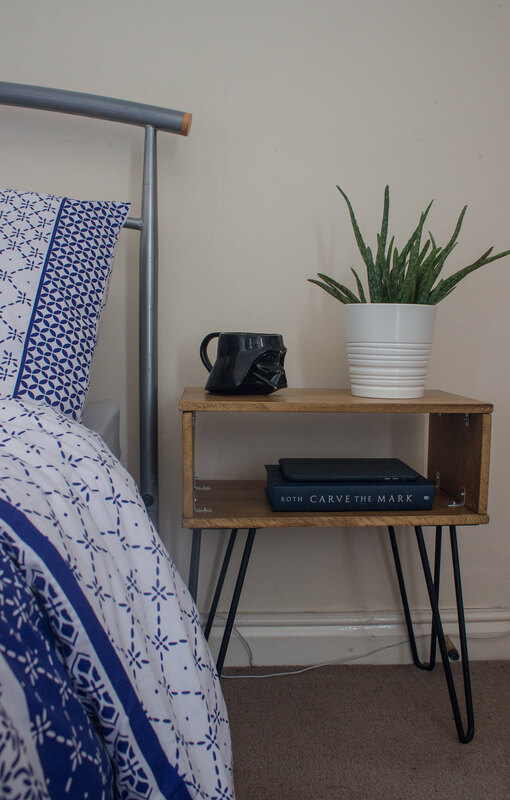 Fancy making your own hairpin nightstand? Pin me for later!